Spike Lee’s latest masterpiece “BlacKkKlansman” is the true story of how Ron Stallworth, an African American police officer in Colorado, infiltrated the Klu Klux Klan. Posing as a white supremacist over the phone using his “white voice”, he convinced David Duke and other Klan members that he wanted to join them in the mission to keep whites separate from blacks. When meeting in person, Ron sends Flip Zimmerman (Adam Driver), a white office, to meet with the KKK, pretending to be Ron Stallworth. As he seemingly becomes a part of the Klan, they are able to infiltrate them and dig their way deeper into “the organization”. “BlacKkKlansman” is full of fantastic performances all around form both the lead cast and the supporting. 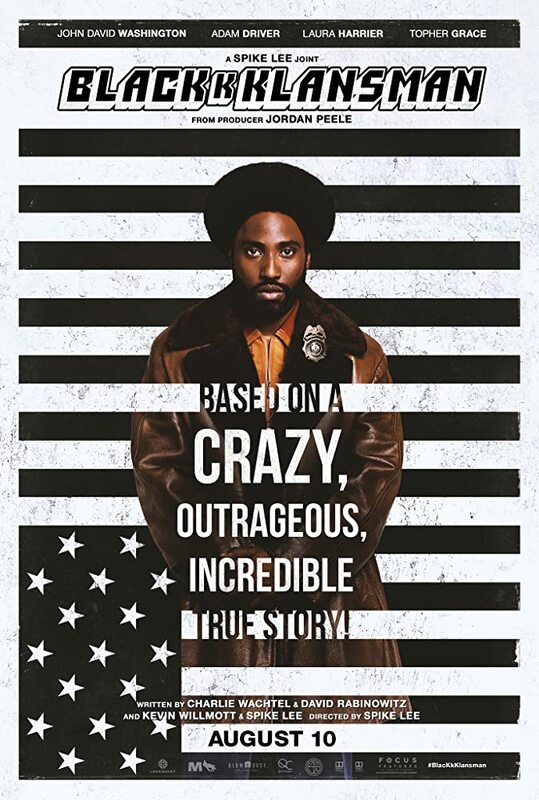 Ron Stallworth is played superbly by John David Washington in the performance of his career and Adam Driver excellently plays Flip Zimmerman. While Driver has had multiple great performances throughout his career, this is one of his bests, up there with his roles in Jim Jarmusch’s “Paterson” and Martin Scorsese’s “Silence”. Surprisingly, “BlacKkKlansman” is full of humor and almost works as a comedy on its own. The film takes many hilarious stabs at the KKK and their lack of intelligence, showcasing the stupidity of hatred and racism. While its humorous, it’s definitely more of a dark comedy. At the same time, the events and people portrayed in the film are all real, so Spike Lee’s masterpiece reminds viewers that hatred exists and will likely continue to exist. Spike Lee’s film is an important one to venture out to the theaters for, especially in today’s political climate. The film makes multiple comparisons to today, showing us how little things have changed. It isn’t the kind of movie to watch if you’re in the mood for a light hearted comedy. While there is plenty of humor, it’s still a heavy film to watch, whether you’re aware of the horrors of racism or not. Spike Lee’s film will likely open the eyes for many to the fact that, despite wishes, not all are created equal. Some award recognition will surely come to this one and rightfully so. Not only is the film socially and politically vital, it’s also an achievement on a filmmaking standard. The acting, writing, music, costume design etc. are all very well done, making for a film that will likely be remembered for years to come.